I went to the same school that Baden-Powell had gone to. Joining the scouts was voluntary to the extent that we did not have to go that school. Obviously we were compelled to take the oath which meant being taught how to tell lies. That was just after World War 2 and I realized that the purpose of the having to join the scouts was to undergo pre-military training. Later we had to play soldiers once a week and learn how to shoot guns. The link with religion was strong as that included learning to hate and be able to kill those who we were told were our enemies. I also detested having to attend the school church every day where we would be preached at by men who were wearing dresses. By the time I left that school I had decided that I would refuse to take part in the National Service but I was fortunate that it was dropped about a year before I would have been conscripted. I am very pleased that I have never had any children. If I had any I would have strongly discouraged them from joining organisations such as the Scouts or Guides. Raktajino – if you had had children and successfully discouraged them from joining Scouts and Guides, it would have be their (and your) loss. 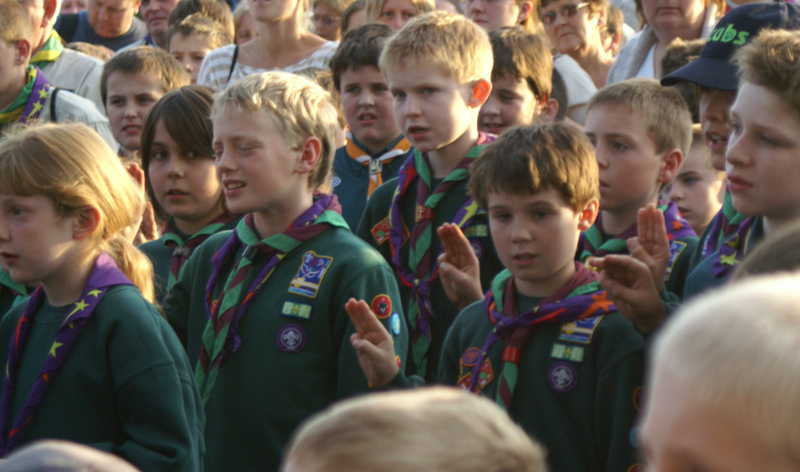 Thankfully life in general, and The Scout Association in particular, has moved on from when you were young. I certainly wouldn’t have wanted to join the organisation you describe, but am proud to have gone through Scouts as a young person in the 60s & 70s, and am proud now to give back to the movement that taught me much about life. What a load of tosh. Really. I’ve been a Scout leader for 20 years and we have NEVER undertaken anything remotely military in training. Good to see so many comments from balanced people – chips on both shoulders! Although it is true that scouts was first started as a para military organisation, it now retains very few of those aspects. Most of those aspects were dropped after WWII, I would encourage you to read some of the later writings of Baden Powel who wrote an awful lot about peace and tolerating other people. Get the book, ‘playing the game’ by Baden Powell, which is a collection of the articles he wrote. It is also the case that most of the Fascist countries banned the scouts and formed their own versions, the Hitler youth only being the most prominent. Toleration and brotherhood have always been a part of scouts, there are 30 million scouts world wide now. So the organisation is far from the militaristic cadet unit it started as. I never was interested in the Cubs or Scouts. I did however, join the Army Cadets although I never swore allegiance to either the crown or god. I abhorred militarism and joined because I had an older friend who was a cadet and he made it sound thrilling (which it was). Summer camps were enormous fun. I yearned to be a Guide when I was a child but would not be forsworn by making a promise that I knew was a lie. If the organisations are damaged by being forced to discriminate on the grounds of religious belief then perhaps it should be considered whether they are worth saving at all. As an ex-scout and ex-scout leader, I hadn’t picked this up. But I think the Girl Guide version is much better than what the Scouts have gone for…. Thought I’d let you know, Ralph. The crossing of fingers is a Christian gesture. I know what it implies today, but it goes to show just how invasive Abrahamism is. Much of what we do socially has religious roots. One has to work hard to rid oneself of all religious mannerisms. As someone who has joined scouting because of the change in promise and being allowed to be true to my humanist views I was a little disappointed that in my initial training I was told that volunteering in scouting is doing gods work and a priest was heavily included in the training and even finished by showing mountains and rivers with God written above them. No mention of the new promise in the presentation or literature. Seems like you got nabbed by a dinosaur, then. Or you’ve joined a church-sponsored group? I trust you challenged them? Shouldn’t have been an issue. It was a county getting started training session. We did mention it and priest mumbled something but the county commissioner who was there saved him. As an Atheist I find even this latest vow wholly unacceptable as it requires honouring an unelected, undemocratic, Eugenicist figurehead – the queen. The queen is ‘defender of the faith’ so a true Atheist cannot honour such. Moreover, the British monarchy is the embodiment of inequality, sexual, ethnic and religious discrimination and is predicated on an elite blood-line steeped in Eugenics. This is utterly at odds with the Scout movement, Atheism, Humanism and humanity.